Combined Military Services Museum01621 841826work MuseumThe Combined Military Services Museum in Maldon is one of the country’s premier military museums. The museum tells the story of the British fighting force from the English Civil War to the present day with unashamed pride and is described by its patron Lord Paddy Ashdown as ‘a jewel’ ‘worthy of national recognition’. Exhibits include the only surviving Cockle Canoe from the famous Cockleshell Raid and a complete set of German invasion plans for Britain in 1940. The collection includes tanks, medals, firearms, swords and much more. All items are original and many have a story relating to their previous owner’s exploits. One famous example relates to the clothing, weapons and equipment belonging to Rusty Firmin, leader of the Blue Team who led the S.A.S. raid on the Iranian Embassy siege. 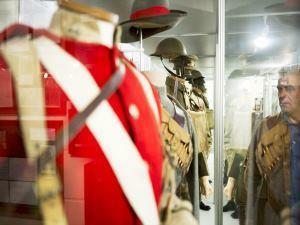 The Combined Military Services Museum in Maldon is one of the country’s premier military museums. The museum tells the story of the British fighting force from the English Civil War to the present day with unashamed pride and is described by its patron Lord Paddy Ashdown as ‘a jewel’ ‘worthy of national recognition’. Spread over three floors, the museum offers visitors the opportunity to discover our military history in their own time. Accredited museum heritage lottery fund. Open Wed, Thu, Fri, Sat, Sun, Bank Holidays and every day during the school holidays from 10:30 a.m. to 5:00 p.m. Last entry 4 p.m. The museum is 0.5 mile from Maldon's high street. It is most easily reached via A13 or A414, then follow Maldon's ring road.